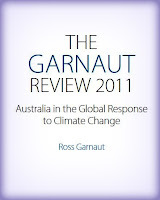 Peter Martin: Garnaut. The final report. 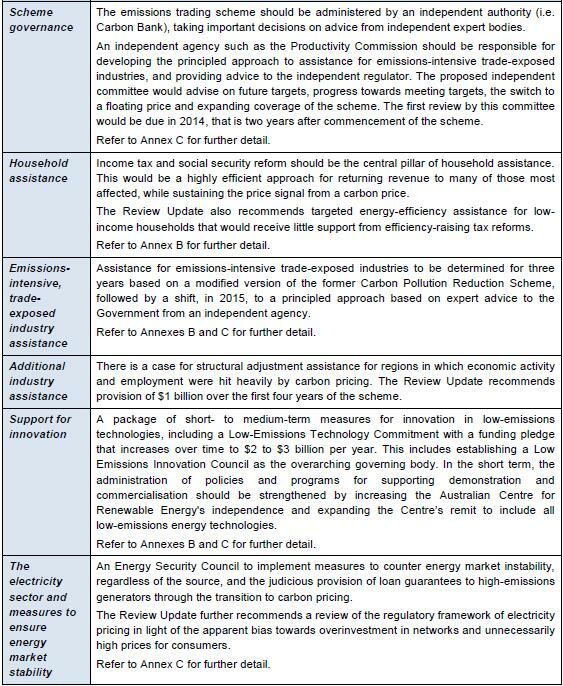 I was explaining to the Multi-Party Climate Change Committee early in 2011 how I had worked out the costs and benefits of reducing emissions for the 2008 Review. The costs of reducing emissions will come straightaway. I got the feeling that the mention of discount rates had set Prime Minister Gillard’s mind towards what she would say to Hillary Clinton about Afghanistan, Bob Brown’s to the grandeur of the Styx Valley, and Tony Windsor’s to the good rain that was falling on the Northern Tablelands. The beginnings of a smile on her face became a hearty laugh. do its fair share in a strong global effort to mitigate climate change. reduce the damage from climate change. change, strong mitigation was clearly in the national interest. affected the national interest case for Australian climate change action. as the range of possibilities for human-induced climate change. data for this book, with the same conclusions. world, although we cannot draw conclusions about direct cause and effect. indicators of an approaching tipping point. are examined in Chapter 1.
probabilities’ to ‘beyond reasonable doubt’. continued strong growth in the developing countries. usual that is little changed from 2008, but is constitutionally very different. China and India has grown as developed countries’ growth has shrunk. 2007—despite new policy measures in the intervening years. China. All countries also agreed to contain global warming within 2°C. intensity by 40 to 45 per cent between 2005 and 2020.
position to offer more aggressive pledges still. one another for reassurance that the pledged progress is being made. 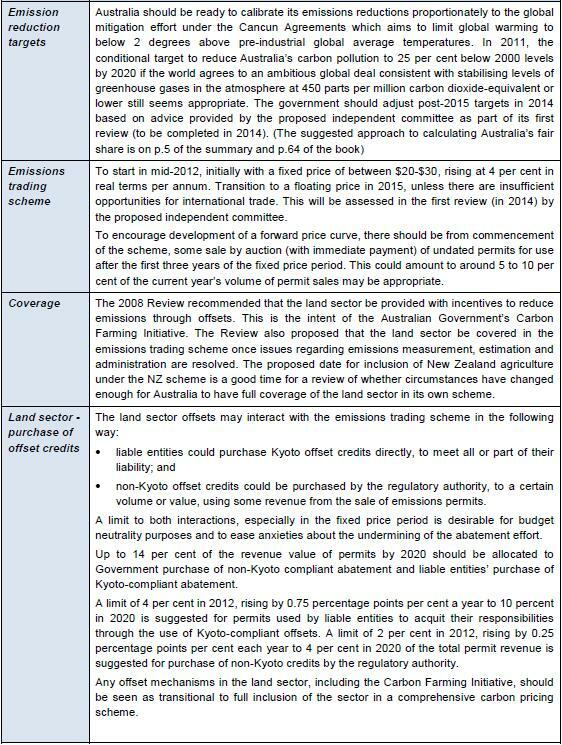 national interest case for a stronger Australian mitigation effort. permits are tradeable between businesses and so the market sets the price. floor or a price ceiling or both. carbon price followed by a carbon trading scheme with a floating price. on the kind of tax and social security reforms envisioned in the Henry review. how compensation should be deployed to each of these groups. more productive ways of doing business. business lobbies were reformed as the Business Council of Australia. and none at all since 2003.
in tears after a longer period. for this among other reasons, cost Australians substantially less. forth. Chapter 8 looks at the likely adaptation measures that will be required. is an issue in which a high proportion of Australians are deeply interested. would invite retaliation in trade and other areas of international cooperation. for the conservative to embrace such risk. as liberal, as they do with social democratic parties. would be no point in Australia seeking to reduce greenhouse gas emissions. We might as well join the other lemmings as they rush over the high bluff. change—much of the rest of the world is not behaving like lemmings. calibrating Australian policy to what others are doing. in light of what others were doing. book, there can be a smooth adjustment to increased international effort. managed in the normal course of business. to make sure we get it. covered in chapters 10 and 11.
providing the basis for a new industry of considerable potential. measures to ease anxieties in parts of the community. prosperity as we make the transition to a low-carbon future.